Info "Paralyze the pests with your toxic spray! or Spray"
Talk to the Can! is one of Dribble and Spitz's Microgames in WarioWare: Smooth Moves. The name is a pun on the saying "Talk to the hand", which is used to dismiss what someone had said. The objective is to spray the pest(s) with the spray can. 1st level difficulty: The player has to spray flies. 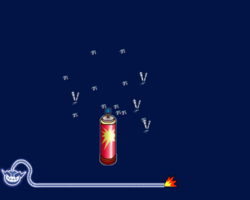 2nd level difficulty: The player has to spray cockroaches, which take slightly longer to kill. 3rd level difficulty: The player has to spray a bear by aiming at its eyes and following its movement. This page was last edited on February 20, 2018, at 15:25.